As stated by a report from Statista, the worldwide ecommerce market will have an increase in sales by over 246% by 2021. It’s a landscape that is constantly evolving which means that you need to know how to implement the latest trends and keep up with the latest innovations in the marketplace. If you think that having product images and an ecommerce plugin is enough to sell something in 2018 and beyond, you better think again. 2019 is just around the corner, and we have the top 8 trends you need to transform your ecommerce business. Technology that improves people’s lives and the shopping experience will be adopted by the most successful online retailers. This includes AR & VR too. More than 24 million VR devices are used globally today. To understand how AR and VR can help ecommerce businesses, we need to look at what these innovations have to offer consumers. As a user, would you rather browse through photos or have a virtual tour of the store first before you buy? Bottom line, everyone prefers real-life shopping experience, which is why using virtual showrooms can save shopper’s time and strength that they usually spend when they go shopping in the mall. Stores across the world such as eBay Australia have already launched their first Virtual Stores where the consumers can get a more enhanced online shopping experience than the usual. Providing almost real-like product visualization to people is a chance for them to try out the product before they buy it, which is a lot like the usual buying routine that we undergo in physical stores. For example, users can put on their headset and all of the sudden they found themselves in the store where all the jeans and dresses are. Ikea famously launched their AR Catalogue App where buyers can see how certain pieces of furniture will fit in their homes. These technologies and devices allow the users to immerse themselves within the shopping experience that you provide, starting from online browsing, visualization, all the way to coming to your physical store and handing you the money for the product. The business-to-business ecommerce transactions will reach $1.2 trillion by 2021. This means that the number of B2B platforms like Alibaba and drop shipping businesses that provide online shopping experience will be increased and the buying experience will become almost as functional as in the B2C segment. This is also aligned with social media trends, because word-of-mouth and communication are vital in B2B, and social media marketing is one of the best ways to market your ecommerce business online. With the rise of Millennials as the number one audience that uses technology for almost every type of purchase online. This means that when the modern audience analyzes a company, they go for reviews online and testimonials from the previous client. This is why featuring testimonials, pricing packages, and live chats are vital if you want to prepare your B2B commerce business for success. The possibility for on-site immediate sale will be more present than before in B2B ecommerce sites. Buyers today know a lead generation form when they see one, and if they want to use your services immediately, you need to make that available to them. Only a decade ago, B2B websites wouldn’t move a step forward from contact forms and sales questions. Today, more and more business provide pricing packages and purchasing opportunities, and there are no signs of the trend slowing down. With AI and Machine Learning technology, chatbots will become more powerful than ever in 2019. The most basic function of chatbots is to replace an actual human being that is on the other side of the conversation when a customer wants to ask a question or needs help. Chatbots Sound Like Humans: Through Natural Language Programming (NLP), chatbots start to act and respond exactly as humans do. This is excellent for businesses because chatbots can handle a lot of the legwork before the purchase. Voice Activation: As Siri and Alexa are becoming more integrated with voice search and other smart devices, we can expect that chatbots will provide answers to questions that are voice activated. Virtual Assistance: Smartphone use is at a historical high and has become routine before and after purchase. With automation, chatbots can combine apps to conduct business tasks and customer service. When people order and buy something online, they expect it to arrive fast. For this purpose, the traditional shipping and cargo services are standard and people can even receive their products within a few hours, depending on where they live. But what the future holds makes the product delivery process more than just shipping and waiting for it to arrive. Amazon already leads the race by starting drone delivery in England. If you happen to live in Australia, through Shipster, you can have your products from over 60 online retailers delivered to your home for up to $19 a year! With innovations in product delivery, the costs will be decreased and the shipping speed will be increased, and your ecommerce business must be prepared to improve its product delivery according to the latest trends. The normal buyer doesn’t want to go through several confirmation pages to get to the checkout page. You have to make the process as quick and as simple as possible. One Page: You will increase your sales success rate by accumulating 3 pages into 1. Make it simple by asking only the necessary information. Anything else should be optional . 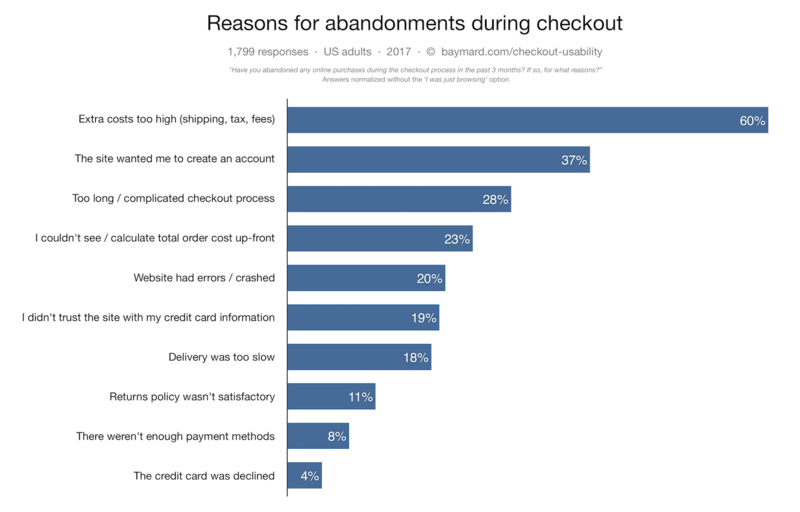 With one checkout page, you’ll reduce the hassle and reduce cart abandonment in the process. Auto-Complete Fields: Cut out the need for the users to constantly input their data. By digital wallets such as Google Pay, Apple Pay, or PayPal, at least once, customer’s data will be used automatically when they choose their paying method. Don’t Push for Registration: One of the constant turn-offs in ecommerce is pushing people to register before they decide whether they want to buy or not. People may not even be planning on returning to your ecommerce site again, so why push them away from the very start? By 2021, it’s likely that 54% of ecommerce purchases will be made through smartphones or tablets. Having a mobile-responsive ecommerce experience doesn’t make you ready for the future. According to a study from DynamicField, only 12% of customers are happy with their mobile shopping experience, which means that this trend has a lot more space for improvement. This is where your opportunity lies. A mobile-first thinking is much more than just an improvement of your online store. Providing flawless mobile shopping experience means that as long as people use smartphones, they can shop no matter where they are. If mobile ecommerce continues to grow as predicted, you can expect that the more you invest in mobile-first thinking and website design approaches, the more chance you have of increasing your ROI and conversion rate. The buyers of today are everywhere, online and offline. This is why it’s important for your ecommerce business to be present where your target users are. With a multi-channel approach, you’ll be able to notify your customers about your latest deals and message them about every stage of the shopping experience. According to a report by Braze, users that were contacted on more than two channels raised their engagement level with the brand by 166%. A multi-channel presence means email, social media, push notifications, SMS, chatbots, and in-app messages available 24/7/365. To make it work, you need to know how to tailor your messages for each channel, but also keeping them cohesive across all channels. Tailoring your multi-channel messaging requires a lot of personalization too. You need to send out specific messages that are based on the interests of the user, the buying behavior, and the pages that the user is browsing. One of the brands that understands the value of omnipresence in ecommerce is Steve Madden. Right of the bat, Steve Madden attempts to win over first-time subscribers/customers with a special giveaway for the exchange of their email addresses. When a buyer becomes inactive on their page, they immediately attempt to reactivate the buyer with customized messages that differ from the ones that they send to regular buyers. To further connect the physical store world with the online experience, the brand also provides an app for users where they’ll be constantly notified and develop their own profile which then can be used for customized messages and special offers from the brand. Shopping is and will remain a social experience. No matter the year, and no matter the trend, it’s about creating relationships, and providing value for the money, all the way from shopping malls to online stores. It is the social nature of shopping is what made platforms like Instagram, and Pinterest start integrating shopping experiences within the platforms. This year, Instagram rolled out the option of tagging up to 5 shopping items for brands. @kvadrattextiles straps celebrate the best of Denmark: color, simplicity, and innovation. Watch our story to learn more about how these recycled straps are made. Pinterest already provides brands with possibilities to share and sell their products on the platform. The difference from Instagram is that the users on Pinterest actively look for what they want to buy. Promoted pins: Normal pins, but just like in Facebook Ads, you pay for more people to see the pin. Rich product pins: You can insert real-time pricing, availability and where to buy information. Buyable pins: The chance of purchasing the product without leaving Pinterest. So there you have it, the top 8 trends that we think are going to make a boom in Ecommerce for 2019. Trends come and go, but one thing is for sure – every innovation needs to be implemented correctly to establish a relationship with the buyers. If you have more questions and ideas about how to implement the innovations above to your online store, we would be glad to help you achieve your ecommerce goals and develop a strategy for the future. Need Help in Growing Your Business? Our WordPress development company will build a WordPress E-commerce solution for your existing offline shop or brand new online store. We will identify the target audience and provide an appealing solution based on your customers’ behavior preferences and the latest design tendencies.